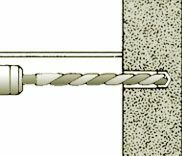 Drill a hole in the base material with a hammer drill and a correctly sized carbide drill bit for the diameter Drop-in anchor you are using. See our technical specifications page for the drill bit size required. Drop the anchor into the hole, slotted end first. 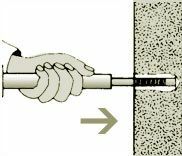 Insert the setting tool into the anchor and strike with a hammer until the lip of the setting tool meets the top of the anchor. Set the fixture over the anchor and insert the properly sized threaded rod or machine threaded bolt through the fixture and into it.